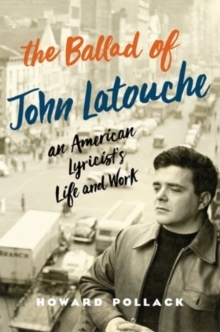 Born into a poor Virginian family, John Treville Latouche (1914-56), in his short life, made a profound mark on America's musical theater as a lyricist, book writer, and librettist. The wit and skill of lyrics elicited comparisons with the likes of Ira Gershwin, Lorenz Hart, and Cole Porter, but he had too, noted Stephen Sondheim, "a large vision of what musical theater could be," and he proved especially venturesome in helping to develop a lyric theater thatinnovatively combined music, word, dance, and costume and set design. Many of his pieces, even if not commonly known today, remain high points in the history of American musical theater. "A great American genius" in the words of Duke Ellington, Latouche initially came to wide public attention in his early twenties with his cantata for soloist and chorus, Ballad for Americans (1939), with music by Earl Robinson-a work that swept the nation during the Second World War. Other milestones in his career included the all-black musical fable, Cabin in the Sky (1940), with Vernon Duke; an interracial updating of John Gay's classic, The Beggar's Opera, as Beggar'sHoliday (1946), with Duke Ellington; two acclaimed Broadway operas with Jerome Moross: Ballet Ballads (1948) and The Golden Apple (1954); one of the most enduring operas in the American canon, The Ballad of Baby Doe (1956), with Douglas Moore; and the operetta Candide (1956), with Leonard Bernstein and Lillian Hellman. Extremely versatile, he also wrote cabaret songs, participated in documentary and avant-garde film, translated poetry, adapted plays, and much else. Meanwhile, as one of Manhattan's most celebrated raconteurs and hosts, he developed a wide range of friends in the arts, including, to name only a few, Paul and Jane Bowles (whom he introduced to each other), Yul Brynner, John Cage, Jack Kerouac, Frederick Kiesler, Carson McCullers, Frank O'Hara, Dawn Powell, Ned Rorem, Virgil Thomson, Gore Vidal, and Tennessee Williams-a dazzling constellation of diverse artists working in sundry fields, all attracted to Latouche's brilliance and joie devivre, not to mention his support for their work.